Tia Leigh Ludwick, center, listens as Aroostook County Superior Court Justice Harold Stewart II speaks to her during a hearing on Thursday in Houlton Superior Court. Ludwick pleaded guilty to murder and robbery charges stemming from the shooting death of Douglas Morin Jr. of Oakfield in 2016. Her attorneys, John Tebbetts, left, and Stephen Smith, right, sit beside her. 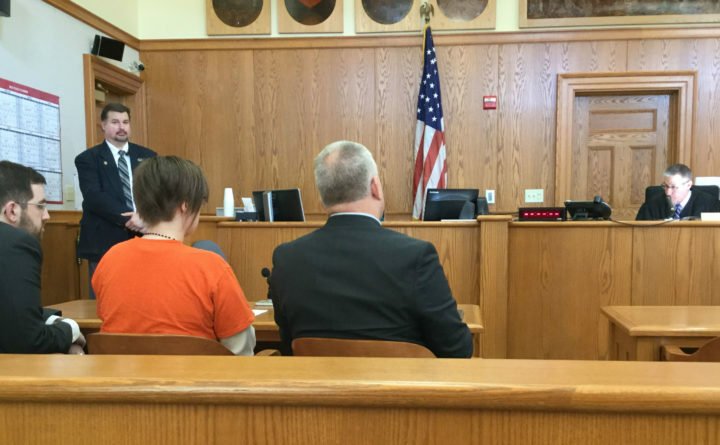 HOULTON, Maine — A Massachusetts woman accused of murder in connection with the killing of an Oakfield man in an apparent drug-related robbery nearly two years ago pleaded guilty to the crimes on Thursday. A second suspect in the case also pleaded guilty a day earlier in the same Aroostook County Superior Court to a charge of robbery in exchange for the state dismissing a murder charge against him if he testifies against a third suspect. An Aroostook County grand jury indicted all three Massachusetts residents in November 2016 in connection with the fatal shooting of Douglas Morin Jr., 31, on Oct. 16, 2016. Tia Leigh Ludwick, 24, of Leominster, Massachusetts; Darin Goulding, 32, whose town of residence in Massachusetts was not listed; and Marcus Asante, 22, of Fitchburg, Massachusetts, were charged with murder and robbery. All three suspects were taken into custody in Fitchburg and Leominster, Massachusetts, between Oct. 21 and 26, 2016. All three eventually waived extradition and were returned to Maine where they remain in prison pending resolution of the case. Assistant Attorney General John Alsop told Superior Court Justice Harold Stewart II in court on Thursday that if the case had gone to trial, testimony would have shown that Morin, whose body was found in his vehicle on PD Road in Sherman, on Oct. 16, 2016, had been shot twice in the back of the head. The prosecutor said that he would have shown that Morin was planning to meet people in order to sell marijuana. The man who had supplied Morin with the marijuana would have testified that he had seen Ludwick in a red car in the community, according to Alsop, and texts found on Morin’s phone matched texts found on a phone belonging to Ludwick and her boyfriend. Alsop also said that Ludwick was “fully aware” that the group planned to steal the marijuana from Morin. He also said that the state found proof that Ludwick knew that members of the group had guns with them. “In one text, she said that she knows that everyone is armed,” Alsop told the judge. Ludwick said little to the judge beyond acknowledging that she knew her rights and understood the plea. She is due to be sentenced in April. Goulding pleaded guilty to robbery on Wednesday in exchange for the state dismissing the murder charge if he agreed to testify against Asante. The state alleges that Asante is the one who pulled the trigger. Asante is scheduled to go to trial in November, after which Goulding will be sentenced.